At about 5:45 am on April 1st (41+2 weeks) I woke up to some different feeling pressure waves (Hypnobabies word for contractions) than I had been having the weeks before with pre-birth waves (Braxton Hicks). I was still unsure it was the start of my birthing time (Hypnobabies word for labor) or not, so I played my “Easy, Comfortable Childbirth” Hypnobabies track and went back to bed, waking just slightly during a wave, then falling back to sleep. Around 7 am I was feeling sure that it was my birthing time as the waves were coming in a predictable pattern about 6-7 min apart. So, I notified my doula, Candace, birth photographer, Brezi, and midwife, Jolene, that baby was probably coming sometime today. From there, I listened to “Your Birthing Day Begins” which reminded me of all the Hypno-tools I could use throughout the day. I then put on my Relaxation music and just snuggled in bed with my husband having a lazy morning. ~9 am We finally rolled out of bed, I made my family breakfast while listening to “Birthing Day Affirmations”, and my mother-in-law came by to pick up our 3-year-old son. My waves began to come closer as I made breakfast but were still short. With prompting from my doula, I did some belly mapping and figured baby was ROP and she reminded me to do a few forward leaning inversions during the day to give him space to move if needed. After the inversion, waves spaced a bit, so I went and took a nap while listening to my “Birthing Day Affirmations” and actually slept for a couple of hours more. During my nap, my sweet husband and mother-in-law cleaned the house, and soon after my 3-year-old son left with Abuela. After the movie ended, I went upstairs to shower, and my husband went to the corner store to get some Dayquil as he had a cold. In the shower with my affirmations playing, I could tell my waves were getting close, and I focused intently on my PEACE cue (Hypnobabies special cue for instant physical comfort) for instant comfort during a wave. As one would begin I would reach my arm up to lean against the tile and rhythmically circle my hips while saying Peeeace quietly to myself. Then, continued washing my hair and shaving my legs! 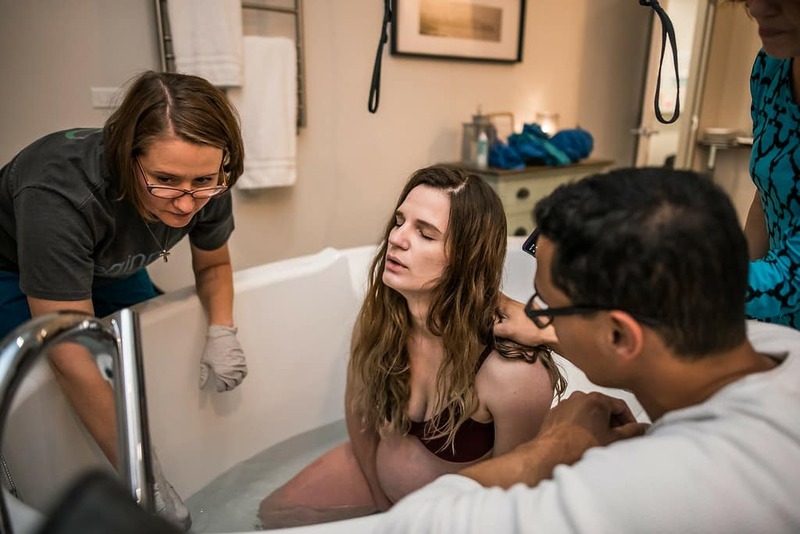 In the shower, I remembered my doula-brain kicking in and thinking “If I was with myself as a doula right now, I would probably be encouraging her to get to her place of birth” – but the waves were still so easy, I was sure I had some time to finish last-minute tasks. comfortable. I asked him to time my waves as I proceeded to actually put on some makeup, because… birth photographer, right!? My husband told me the waves were coming about 2.5 minutes apart and lasting 45-50 seconds. This is the funniest part of my birth story to me, because in hindsight I was literally shaving my legs and putting makeup on while in transformation (Hypnobabies word for transition). ~7 pm I asked him to message my birth team and tell them how close the waves were, and at that time I began to feel a slight sensation to hold my breath during my waves (like the feeling of getting in cold water). 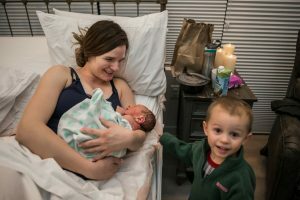 I remembered the same sensation moments before pushing my 1st son out, so at that time I told my husband we needed to leave for the birth center. 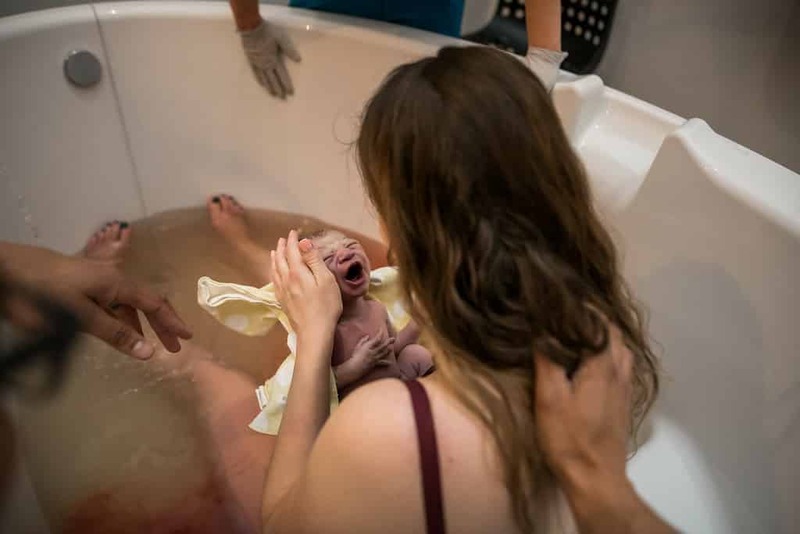 ~7:15 pm As we got in the car I put my “Deepening” track (Hypnobabies track to deepen the level of hypnosis) on my headphones and relaxed the entire way to the birth center, imagining my hypno-anesthesia and making low, quiet ahhh-ing sounds during a wave. (Still saving my most powerful hypnosis track, “Easy First Stage”, in case things were to get stronger). My waves spaced a little during this point and again, being a doula, knew that probably meant I was about to start pushing soon. However, despite our 20ish minute drive to the birth center, I never felt worried or panicked. I said a little prayer in my head that baby would wait until we arrived at the birth center to be born and then continued listening to my track. ~7:30 pm We arrived at the birth center, and my photographer and Doula greeted us, with my midwife just seconds away. I walked into our beautiful birth center room, and went to the restroom for one wave, asking my doula if she would begin filling the tub for me and hang some support handles, then told everyone I believed I had a slight cervical lip, which was maybe producing that breath-holding sensation. I came out of the bathroom and had another powerful wave leaning on Mike. This time I felt the need to hold my perineum, and right then with a pop, my bag of waters released and following the waters I could feel a little head and tuft of hair beginning to emerge! “Okay, I guess I don’t have a lip!” I said. At this point, my wave was bringing him down quickly, and I began to breathe through it as to not push him out too fast. I don’t know if I said it or just thought it, but I remember telling my baby we needed to slow down just a little bit. My wave ended and my midwife offered me the tub before the next pushing wave. I waddled into the tub with just enough water for him to be born in. With another wave I focused on my breathing, allowing my perineum to stretch. As it finished, I took a short break, then finished pushing my baby’s head out between waves so I could control the speed at which he emerged and prevent any tearing from happening (it worked! Not even a slight tear!). 7:43 pm His head was born with the guidance of my hands, and then the rest of his body. My midwife instructed me to wait a moment before lifting him as she removed a nuchal cord and then we brought my sweet, healthy, baby boy up into my arms. Welcome Earth-side baby Trey! I told him what a beautiful job he did and thanked him for helping mama. 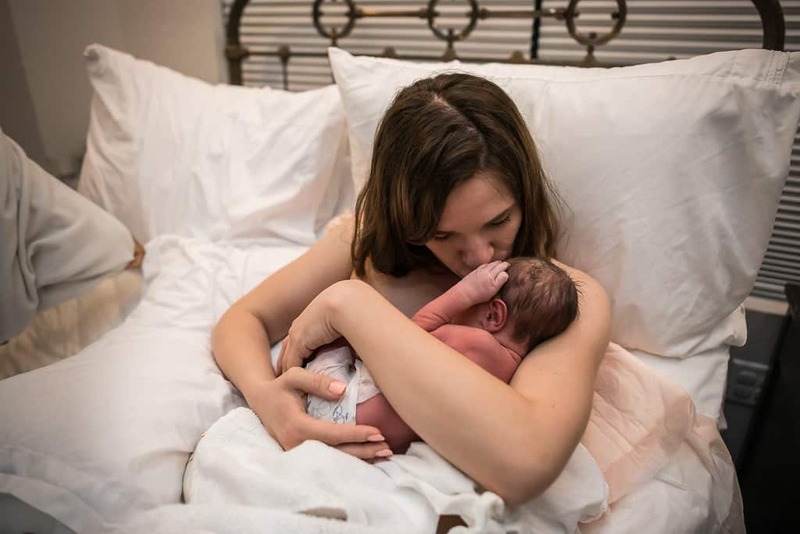 My immediate postpartum stay was nothing short of perfect. 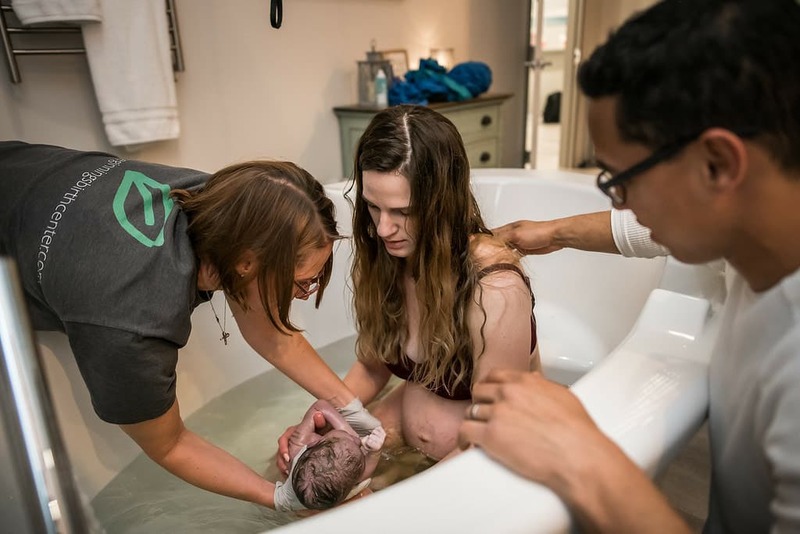 All of my birth attendants (midwife, nurse, doula, and photographer), were also dear friends I’d had long-time relationships with from my first pregnancy and from working in the birth field. The Beginnings Birth Center was beautiful and quiet and intimate. I was spoiled with fresh-baked bread, kisses from my husband, and loving praise and congratulations from everyone in the room. Family came by with a hot meal and flowers and our 3-year-old son as he finally got to meet his long-anticipated baby brother. 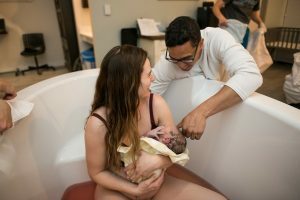 Thank you to all of those who gave so much love and support through this journey and thank you Hypnobabies for providing me with the tools to have an easier, more comfortable, and yes, pain-free birth.